I did not enroll in a Medicare Part D plan when I was first eligible, how do I calculate my Medicare Part D late-enrollment premium penalty? Question: I did not enroll in a Medicare Part D plan when I was first eligible, how do I calculate my Medicare Part D late-enrollment premium penalty? Answer: If you did not enroll into a Medicare Part D prescription drug plan during your Initial Enrollment Period (IEP) and you did not have other creditable prescription coverage (like VA or employer benefits), you could be subject to a penalty that is added to your monthly Medicare Part D premiums. In addition, if you canceled your Medicare Part D plan or were without creditable prescription drug coverage for more than 63 days, you also may be subject to the late-enrollment penalty. The Medicare Part D late-enrollment premium penalty is assessed for every month a Medicare beneficiary is without some form of creditable prescription drug coverage. "Creditable" drug coverage is any prescription coverage that is at least as good as Medicare Part D prescription drug coverage, such as such as VA drug coverage or employer coverage. For example, if you turned 65 (or became eligible for Medicare) in January 10, 2012, your Medicare Part D Initial Enrollment Period would extend 3 months beyond your birthday month or until April 2012. This means that, if you do not enroll in a Medicare Part D plan during the Initial Enrollment Period, your penalty would start accumulating in May 2012 and continue until you actually join a Medicare Part D plan or obtain some other form of creditable prescription drug coverage (or are exempt due to your low income status, such as qualifying for Medicaid). The actual Medicare Part D late-enrollment premium penalty is calculated as a premium increase of 1% of the annual based premium (for example, $33.19 in 2019) for every month you have been without creditable prescription drug coverage - assuming you do not have any other form of creditable prescription coverage or are otherwise exempt from the penalty. To continue the example, if you never had Medicare Part D coverage - and were first eligible for Medicare on January 10, 2015 (hint: you can use your own eligibility month to calculate the actual penalty) - and you enrolled in a 2019 Medicare Part D plan starting January 1, 2019, your maximum penalty may as high as $14.60 per month paid in addition to your monthly Medicare Part D premium (May 2015 through December 2018 = 44 months * 1% of $33.19, the 2019 base Medicare Part D premium). The penalty is permanent and will fluctuate every year based on the national average base Medicare Part D premium. 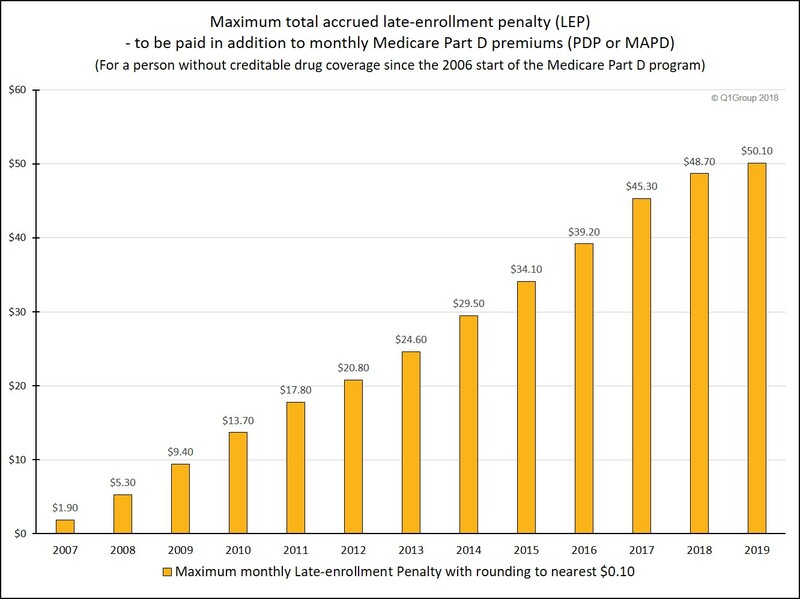 Here is an example chart showing how a Medicare Part D late-enrollment penalty can increase over the years. This chart is assuming that the Medicare beneficiary was eligible for a Medicare Part D plan back in 2006, but decided not to join a Medicare prescription drug plan until 2019. The exact amount of the Part D late-enrollment premium penalty is re-calculated each year by the Centers for Medicare and Medicaid Services (CMS) and then reported by CMS to your Part D plan. Your Medicare Part D plan will then send you a letter regarding the amount of your penalty. The letter from your Part D plan will also detail how the penalty was calculated and explains how you can ask for a review of your the Late Enrollment Penalty (or LEP). Click here for a few more details on the late enrollment penalty. Mrs. Martinez is currently eligible for Medicare, and her Initial Enrollment Period ended on May 31, 2012 . She doesn’t have prescription drug coverage from any other source. She didn’t join by May 31, 2012, and instead joined during the Open Enrollment Period that ended December 7, 2014. Her drug coverage was effective January 1, 2015. Since Mrs. Martinez was without creditable prescription drug coverage from June 2012 through December 2014 [31 months without drug coverage], her penalty in 2015 was 31% (1% for each of the 31 months) of $33.13 (the national base beneficiary premium for 2015) or $10.27. Since the monthly penalty is always rounded to the nearest $0.10, she paid $10.30 each month in addition to her plan’s monthly premium in 2015. In 2016, Medicare recalculated Mrs. Martinez’s penalty using the 2016 base beneficiary premium ($34.10). Therefore, Mrs. Martinez’s new monthly penalty in 2016 is 31% of $34.10 or $10.57 each month. Since the monthly penalty is always rounded to the nearest $0.10, she’ll pay $10.60 each month in addition to her plan’s monthly premium. Please note: In certain situations, you can appeal your late-enrollment penalty. Remember, not everyone is subject to the Late Enrollment Penalty. CMS provides that there will be no Late Enrollment Penalty "for any beneficiary eligible for the low income subsidy" or Extra Help program. Any chance of repealing the late-enrollment penalty? Back in 2005 and 2006, some people thought that the premium penalty would go away or would not be enforced or be repealed as unfair to seniors who had not learned about the Medicare Part D program. Unfortunately, the Late- Enrollment Penalty or Premium Penalty did not go away and some Medicare beneficiaries who did not join a Medicare Part D plan when they were first eligible or who were without creditable prescription coverage for more than 63 days are now beginning to join Medicare Part D plans, and then receiving letters from their new Part D plans about how their penalty will increase (or more than double) their monthly premiums.